Regardless of where you live, demographics are changing and must be a factor in your planning on how to tackle the marketplace. Demographics affect all Marketers as not one sector of your economy (regardless in what country you live in) will go untouched by these changing trends. In the U.S., demographically, the country is growing, aging and diversifying. The most rapidly growing age segment in the US, is and will be, 55+. As such, Marketers must be aware of, and plan for the fact that as time goes on, spending on services will grow at the expense of spending on goods. No doubt the 2007 - 2009 Great recession had a significant impact on the U.S. economy, as well as the U.S. birthrate. The latter of which will have a significant, continuing demographic affect. 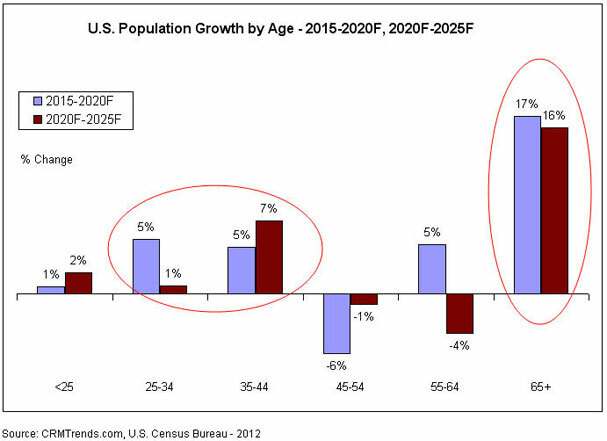 Looking ahead, the two charts below give a sense of how the population will break-out by 2025. Cohort definitions (i.e. age ranges) vary significantly. A little explanation is therefore required for our age breakouts - which we think is a little more scientific than most explanations. Many of the age breakouts we read in the press by so called "experts" seem to us, to be very arbitrary and served-up without explanation. To us, the operative question is, "how long is a generation?" The root, gen-, means “to come or bring into being.” William Strauss talks extensively about this in his bestseller “The Fourth Turning." Early in the last century, each new marriage implied a new social generation. With the arrival of modernity, this changed as people began to talk about peer groups – those who have a common childhood, a common adolescence. But what is the length of a generation? To determine this, demographers have tried to determine a generational persona. Every generation has one. While there is no fixed formula for identifying the persona, Strauss identifies three attributes that help define a generation: common location in history, common beliefs and behavior and perceived membership in a common generation. For demographers, a new generation is usually discovered, on average every twenty years (dating back to the American Revolution, every generation but one has had a duration ranging from 17-24 years.). Given that generation duration has been a recurring pattern, we have taken what we perceive to be the safe and generally accepted route and have thus defined a generation as being twenty years in the chart above, with the exception of Generation X - which consensus seems to place at fifteen years. Baby Boomers are probably the only well defined generation. Every other cohort has been defined in relation to the Baby Boom generation. As such, there is no precise definition of the other generations. For some demographers, Gen Y (or the Echo generation) is a subset of Gen X. For others it is synomonous with the Millenial generation. By 2020, the median age in the U.S. will be 38.3 years of age, steadily increasing and, somewhat, plateauing at 40 years of age by 2030. 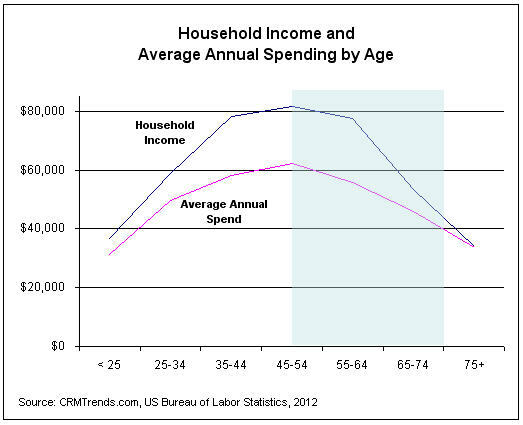 There will be growth at the younger end of the age spectrum as Millenials reaches its prime household formation years. Marketing to this generation will be challenging as their mind set and approaches to the marketplace are radically different from preceding generations (strong skew toward diversity, recreation and entertainment). Another key demographic change is the multi-cultural make-up of the U.S. The United States is the third largest Spanish-speaking country in the world. Over half of the net US population growth between 2000 and 2010 came from the Hispanic population - which grew four times faster than the the total population. Over half of this population resides in just three states: California, Texas and Florida. Nearly half of the population younger than the age of 25 will be non-white (45%). The affects of this evolution have touched every facet of our everyday lives e.g. today, salsa has passed ketchup in United States sales. Granted that this first occurred in 1991 and salsa certainly tastes better than ketchup, but changing demographics will continue change the landscape of America and the rest of the world. The population explosion and geographic dispersion of Hispanics are a key driver of diversity in younger generations. Expect smaller households and fewer traditional family households due to the aging population, empty nesters and singles, both young and old. As such, expect to see products and living spaces become smaller and more personalized - and experiences that are fun... for one. Baby Boomers will have new needs driven by smaller households, increased emphasis on health and general welfare and increased service demands. "Help me" replaces "do it yourself." They will have new requirements - such as smaller, closer, easier. They will have new desires - such as quality of life, experiences, entertainment, enrichment, leisure and legacies. And they think and will continue to think of themselves as being early "middle age" and that "old age" is still almost 20 years in the future. As such, as the Baby Boomers move on, expect to see softgoods take the earliest and biggest hit in terms of purchasing - homegoods and consumables will soon follow. On the other hand, Millennials will be very interconnected. Anything goes; everything is available and nothing is private. They will place a high level of importance on individualism, self-fulfillment and personal involvement in the creation process. To prosper with these folks, companies and organizations will need to provide this generation with the tools needed to create and co-create - all the while tapping into their in control, indulgent and individualized psyche; summed under the credo of "why not?" Compared with the big-spending Baby Boom generation, these new spenders will be less attractive as fewer will have reached their big-spending life stages. They will not only have less buying power, they will also be more fragmented into niche interest markets. They will demand more personalization and be harder to reach with conventional marketing. In keeping with our site's mission to represent CRM best practices, we reiterate our call that should you come across content and links that, in your opinion, represent the best of the Internet, we strongly encourage you to pass them along so we can continue to keep our community abreast of the latest and best.